Townsville is apparently a lot better now. Then it was a bit of a crappy place to live. Big army barracks, a lot of aboriginals (I AM NOT RACIST) but the that combination seemed to result in a lot of brawls and ugliness. I have to go up there at some point early next year for my eldest's basketball rep playoffs, so I'll report back. By the way, he won the grand final yesterday in his club league - yay! Also, apparently I end all my posts with caps now. What the hell, EP, get it together, man. Get your knobby thing away from me. I'm just going to say that I don't know what a townsville is and that's where I lost track of this thread. Although I've been to lazy town. I don't know if that counts. Considering "ville" is French for "town", it translates to Townstown. So, next week it's Fla for me. Where do I find the kissing zoo? Ya know, I've been to many things in Florida, including Weeki Wachee, but I've never seen the mermaid show. (Which supposedly is a throwback to the cheesy, simple, 1950s, pre-Disney attraction days.) The preserve is a lovely place to canoe though. As a chile, my P&M brought me to Fla. We strolled Cypress Gardens & cruised Silver Springs glass bottom boats. 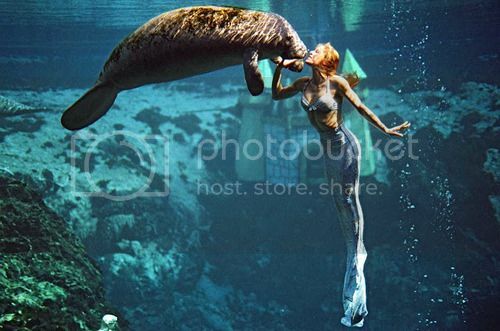 I remember seeing more huge billboards for WEEKI WACHEE LIVE MERMAIDS!! than for anything else, including See Rock City. I wanted to see the merfolk, but teh 'rents could not abide such gyppery. They bought me a cheap Styrofoam surfboard. I paddled out & tried to stand on it. It sundered amidships, foundering me deep in the Pelagic Depths. I stomped & sputtered the whole fifty feet back to the beach. Along the way, a large bloodthirsty pirahnacuda darted right past my legs. I never much cared for oceanic swimming after that. Google informs me of at least two Guitar Centers in teh Tampa Metro Area. Troll their used gear bins, I will. And I hear cubans are mighty tasty. How about it, Metro? Wanna eat cubans with me? Plink Floyd wrote: Google informs me of at least two Guitar Centers in teh Tampa Metro Area. Troll their used gear bins, I will. 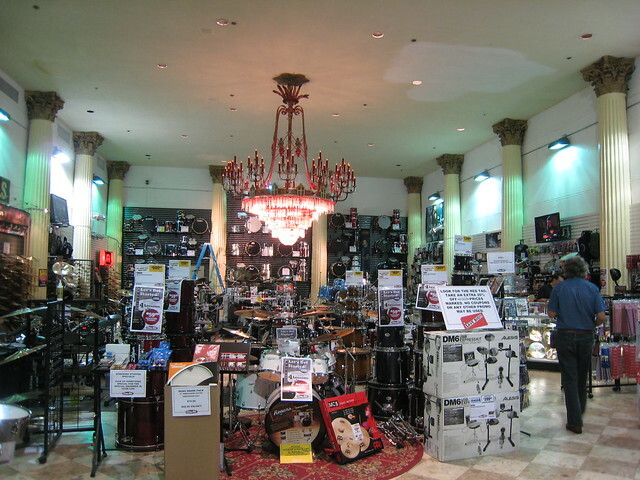 Another good one to visit is the Sam Ash in Clearwater. Tis probably one of the most unusual Sam Ash stores looks wise. This used to be a restaurant / tourist attraction called the Kapok Tree. It was a place that combined huge dining rooms, mediocre food, and spectacularly gaudy ordinations and gardens in a way that just screams old school Florida tourist. The folks that brought Sam Ash in didn't really modify the building much, so, while trolling the used gear bins, you can also check out the old Roman columns and chandeliers and the garden (faux statues and all) outside that they still keep in okay shape for special events. I can tell you right now the GC on Hillsborough ave is under construction and they have zip. Much of it is put away or sold off. If you're looking for used gear, i'd check online before looking at it in person. If you wanna go, we can, but I'm not saying our music stores would be a highlight of your visit here.They tend to be very hit and miss and sometimes more shabby than not. I actually prefer the Sam Ash on Fletcher Ave. But for a while, GC seemed to have quite a lot of new / cool stuff and I liked the way they organized the keyboards by type. Controllers, 25 keys, ROMplers etc. It made it really convenient to demo them back to back. MetroSonus wrote: We can do cubans. How bout a clambake? Can we haz one of thems? I know! Let's go into the interior and find some methed up cracker with a scary fast swamp rocket & I'll pay him to drive us through a golf course or something. Or just a regular air boat ride would be cool. U evar done that? Say, like this place? That Sam Ash looks pretty cool. The one in Indy is bigger than the two GCs combined, but they never have much used stuff. I like to scrounge for bargains as much as I like to see the latest greatest. One of the most enjoyable meals I ever ate was @ a little hole in the wall place somewhere along the keys. All we had were a couple of planter's punches and a pile of peel-&-eats. I used to go to that Sam Ash all the time back when it was a Thoroughbred. They had all sorts of cool clinics. You could walk in on a Saturday sometimes and Jeff Berlin would be there playing for you, with nobody really paying attention to him. On other days, you could see Frank Gambale, Dave LaRue, Billy Sheehan or even Yngwie noodling around. Thems were the days. Only if we can have the gauche Polynesian theme. Believe it or not, I've never done an airboat tour. There's a few places around here. And it'd just be me for the day. My son can has school and the wife will be at her respective place of business. So whatevs. You guys have a beautiful bromance going on. Well, the way it was was this: If Elvis wanted a Polynesian Pensacola Clambake, they by-darn dug up a Pacific island and brought it over! And really, I like all things boat related. I've wanted to ride an airboat ever since I used to watch this show on BW telly. So let's pick a tour and you shall be my guest.